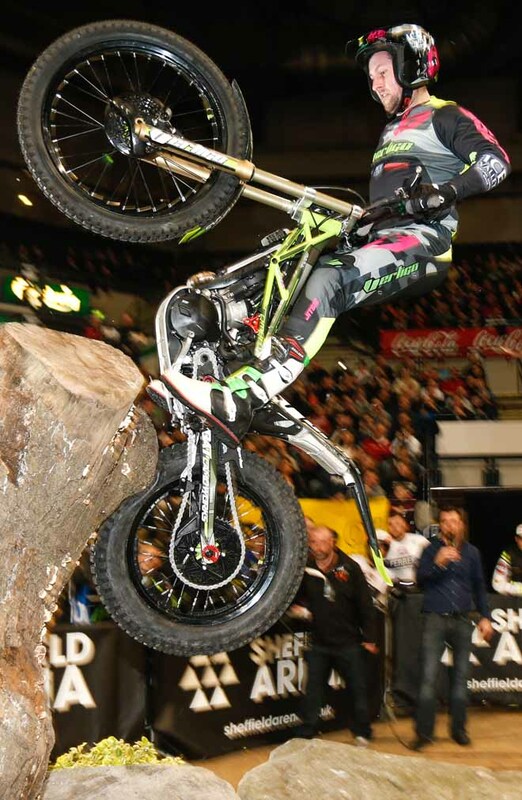 Adam Raga – TRS recorded an amazing and emphatic win at the opening round of the 2016 FIM X-Trial World Championship held at Sheffield, Great Britain. 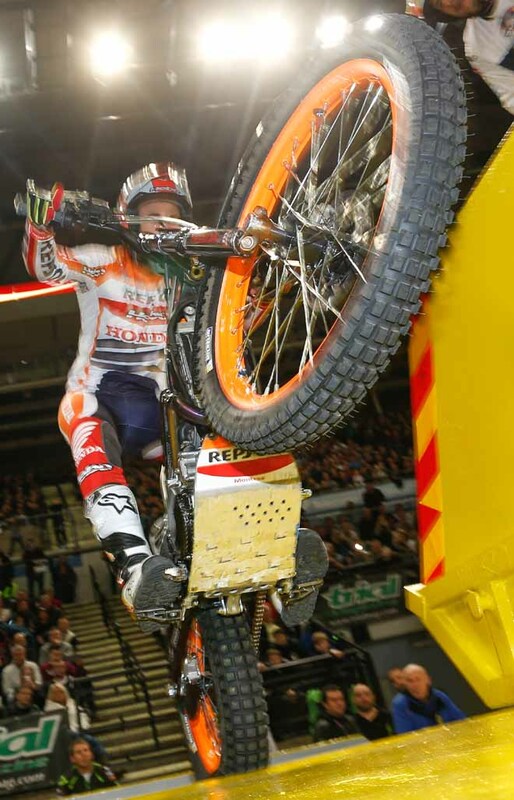 Best in qualification, Raga continued his white hot form through to the final as he drew the all important first blood from his arch rival and defending champion Toni Bou – Repsol Honda who had to be content with second on the night. 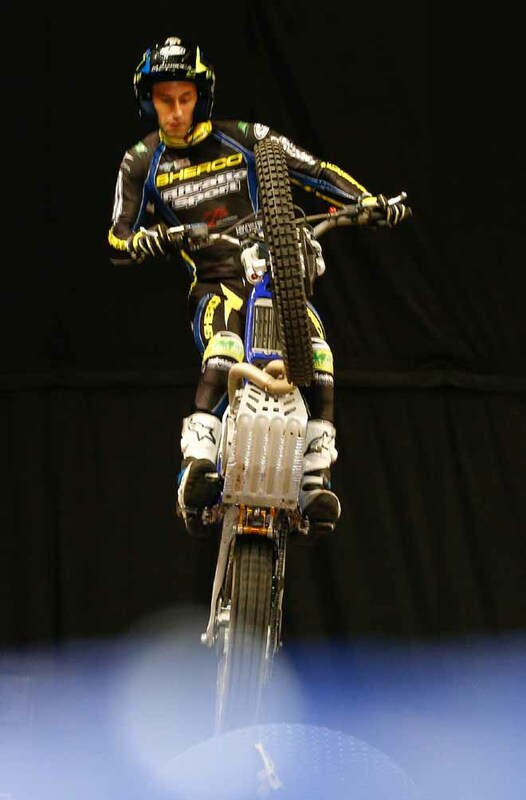 Albert Cabestany – Sherco completed the podium as Jeroni Fajardo – Vertigo made it an all Spanish top four. This was Raga’s first victory at Sheffield since 2005, a year when ironically he then went on to win the title, a fact he is sure to be only too aware of. Six technical sections faced the seven fixed riders plus one wildcard entrant, with the dual lane race again being used to decide the riding order of each pair that came to the floor. Home hero James Dabill – Vertigo and Sweden’s Eddie Karlsson – Montesa were first out with Dabill edging the race to grab an early advantage over his Scandinavian rival. Karlsson suffered immensely as he pioneered his way through each of the six hazards and ended his evening with a maximum score. Dabill began promisingly and looked like he might just cause an upset amongst the higher order, but his challenge was to fade through the latter hazards to give him a total of twenty-one marks. This would put him seventh place on the night, with Karlsson classified eighth. Making a much welcomed return to the series Takahisa Fujinami’s – Repsol Honda entrance was met with huge applause as he rode his qualifying lap alongside Alexandre Ferrer – Sherco. 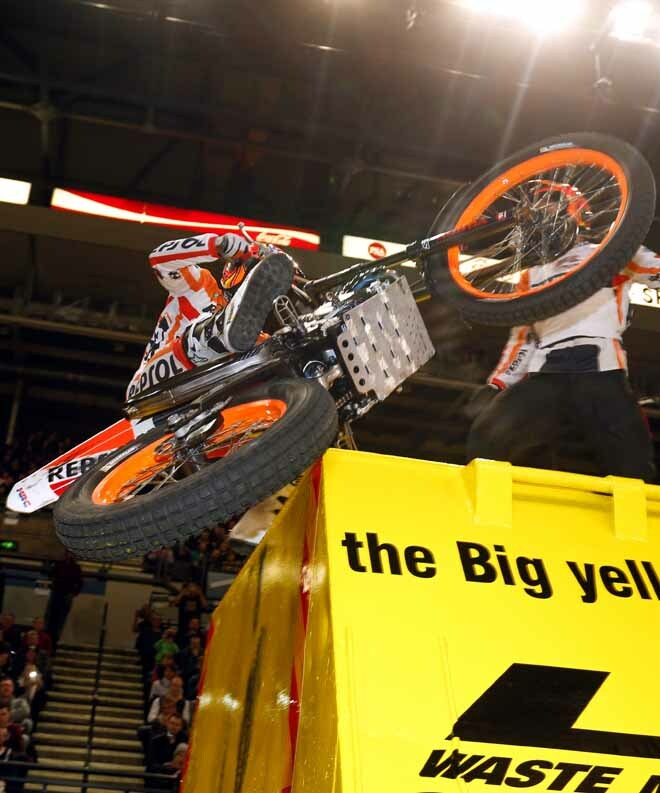 Fujinami gave the almost capacity crowd much to cheer about as he became the first rider to conquer the large black boxes in the second section. 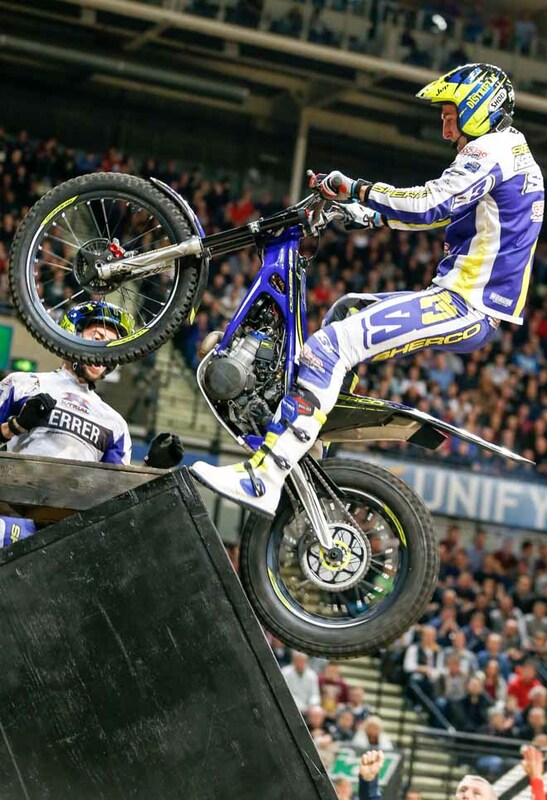 Both riders put up respectable performances, but with scores of fourteen and seventeen respectively neither Fujinami nor Ferrer transferred to the final and had to be content with fifth and sixth positions. Things stepped up a level with the arrival of Cabestany and Fajrado to the arena floor. Cabestany was the first to clean both the steep undercut step in the second hazard and the awkwardly angled oversized oil bottles in the third section. His total of five marks was to come in the remaining two sections and saw him tied with his sparring partner and compatriot Fajardo who enjoyed a strong initial showing on his new mount. The final pairing of Raga and Bou was greeted with much expectation as these two archenemies once again prepared to trade blows. Raga was to come out on top on the opening scrap as Bou uncharacteristically slipped off the side of the third hazard to put Adam in pole position for the final with a loss of just a single mark. Fajardo was to come out the best of the two tie-deciding races as he first beat Cabestany and then Bou to claim second spot behind Raga in qualification. Bou eventually ended lap one in an uncustomary third position with Cabestany down in fourth. 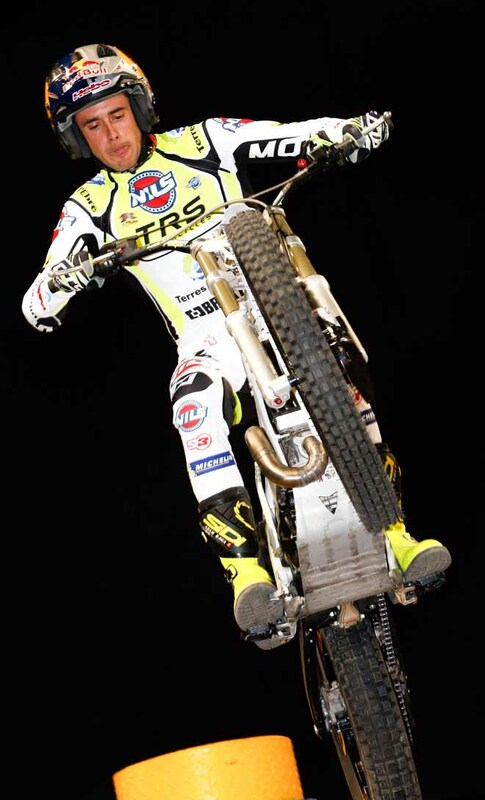 Whilst Bou would come out on top of the head to head races to decide the riding order in the final, any advantage he had gained was soon lost as he made another unforced error in the second section to leave himself with an uphill battle that he was not to conquer on this occasion. Whilst Bou was to only part with two further marks he was never able to close the gap on Raga who produced one of the best rides of his long career. His four mark winning margin over Bou was more than deserved, as Cabestany just did enough to prevent Fajardo making it on the podium on his Vertigo debut. 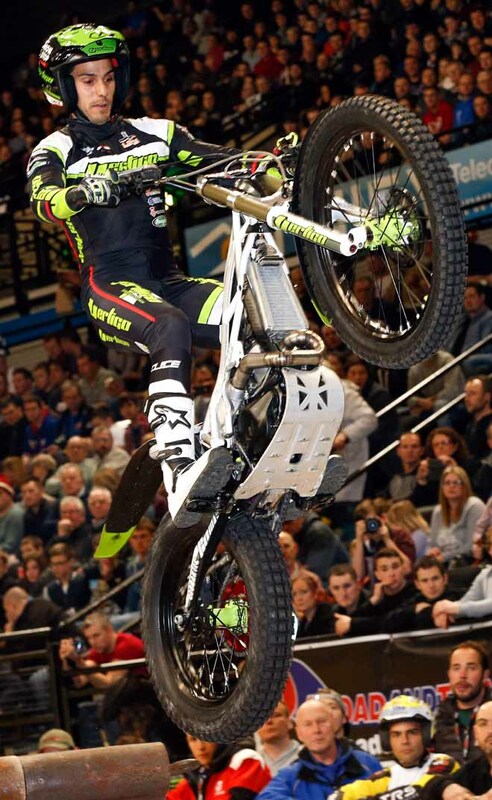 Raga now leads the general standings as he heads to the second round in Barcelona, Spain on 7th February, where Bou will surely be eager to gain revenge and get his title defence back on track. Adam Raga - TRS senza sbavature, in testa nelle qualificazioni ed attentissimo a non sbaglare in finale. Per Toni Bou - Repsol Montesa due errori fatali sia in qualifica che in finale.